A puzzle game with balls. Xorballs is a challenging puzzle game for programmers and people who like logical puzzles. Manipulate balls by placing tiles. It starts simple but ends as a fully Turing complete system. 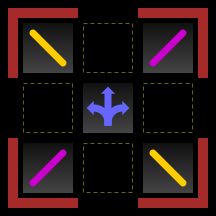 On the right you will find new controls to create and manage your own custom tiles. Read more about it in the help page.